When it was published in 2015, Andrew Hartman’s history of the culture wars was widely praised for its compelling and even-handed account. Yet, what received nearly as much attention was Hartman’s declaration that the culture wars were over—and the left had won. In the wake of Trump’s rise, which was driven in large part by aggressive fanning of those culture war flames, Hartman has brought A War for the Soul of America fully up to date for this second edition, which look towards the signs of a new politics to come. We sent him a few questions recently to find out what it feels like to be wrong and what he sees for the future. 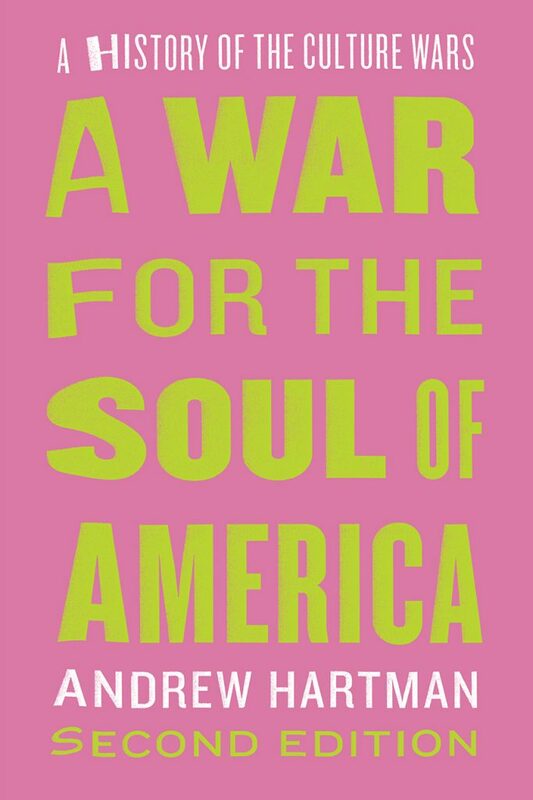 The first edition of A War for the Soul of America: A History of the Culture Wars, argued that the culture wars had basically played themselves out. There would still be skirmishes, but the larger struggle had reached its endpoint, and that endpoint represented an overwhelming victory by the left. Two months after the book was published, Donald Trump came down the escalator at Trump Tower to announce he was running for president. So . . . how’s it feel to be wrong? Ha! Well, it’s not the first time, nor will it be the last time I am wrong. Lesson learned: quit predicting the future; stick to history. But more seriously, as I argue in the new conclusion to the second edition of the book, I do not believe I was entirely wrong. The culture wars of today—the cultural conflagrations that Trump masterfully manipulates—have a different feel to them than the culture wars of the 1980s and 1990s. Today’s culture wars, which feel even angrier, even more existential, are shot through with anxieties and fears about other historical developments, namely capitalism’s transformation into what we call neoliberalism, and climate change. One of the signal contributions of your book is simply to take the culture wars seriously. Many of us, myself included, have often thought of them as a frustrating sideshow—just a tool for politicians and activists to get the rubes ginned up so they could then make use of that anger to achieve other goals. You show, however, that while the moment-to-moment manifestations of the culture wars, from the fainting over Piss Christ to Dan Quayle attacking Murphy Brown, may have been silly on their face, they represented a genuinely important argument over changes happening in America and the changing definition of who and what an American was. Do you see the same sort of argument driving today’s often Twitter-fueled micro-controversies? Or have things changed? It is always tempting to think about contemporary cultural controversy as unserious. See H. L. Mencken’s response to the Scopes Trial. He and his cosmopolitan readers were quite certain the rubes who lined up behind William Jennings Bryan in defense of teaching creationism were silly at best. But historically that trial, and the national response to it, represents something profound about changing intellectual and cultural norms in the context of a large and diverse democracy. Same goes for the culture wars in the 1980s and 1990s, and same goes now. Such an approach is the purpose of history and the historical sensibility. To take the long view requires empathy, even to those who seem to be acting in silly or hyperbolic fashion. Their silliness or hyperbole might just be significant historical indicators. One fascinating point you make in the new afterword is about a shift in the place of the humanities in the culture wars. From our current perspective, you could almost argue that Alan Bloom and someone like Kate Millet were on the same side regarding the humanities in the 1980s—an assertion that would have gotten you laughed out of the room at the time. But ultimately both sides were arguing, not about the value of the humanities—they were taking that as a given—but about the makeup of a humanities education, and whose perspectives and values it should encompass. Nowadays, the right has all but given up on the idea of a broadly humanistic education in favor of what is essentially vocational training, and even many on the left seem to be pulled by that same gravity. How did this happen? There were always those who did not support the humanities, who have thought of them as useless. The long history of anti-intellectualism in the United States speaks to this. But it is notable that during the culture wars of the 1980s and 1990s, all sides in a very public national debate supported the humanities as something essential to national citizenship. Where they disagreed was over what the humanities would look like. Now, at the same time we also saw the continued rise of profoundly anti-humanist business schools, but the most prominent conservatives, like Secretary of Education William Bennett, were making the case for the humanities. Now such people are voices in the wilderness. They have been swamped by events that have come to make the humanities seem like a luxury in austere times. In short, neoliberalism is the root cause of this change. The fight for a free college education is also a fight for an education that is useless in the best sense of the word—an education without a clearly marked vocational trajectory. But also, part of the reason conservatives quit fighting for the humanities is that the left won the debate about what type of humanities should be taught in the university. But the victory was clearly pyrrhic. Another point you make in your afterword, though I suspect it could be expanded on and end up a source of fruitful argument, is that it may be reasonable to look at the 1960s to 1990s culture wars as a distinct historical period—that a combination of factors (Cold War investment in education, midcentury prosperity, the baby boom, etc.) interacted in unexpected ways to simultaneously put wind in the sails of a leftist project of inclusion and generate a backlash from people in power who hadn’t realized how people would use the tools they were being given. Do you see a similar coming together of diverse factors in the growth of new activism in recent years, from Black Lives Matter to the student-led anti-gun movement? I do see a coming together of diverse factors, and perhaps in twenty or fifty years it will seem evident that such factors went into the larger making of a new left of some sort. Right now, it is difficult to make such a determination because we live in an era of fracture, so each movement seems to speak to an issue and only that issue. At an intellectual level, we might be able to make connections between these issues, but on the ground, within the movements, such connections seem remote. Conservatives might be useful in this regard since they tend to paint any social movement from Black Lives Matter to #metoo to gun control to Medicare for All with the same brush. Socialism! In this way our current moment of extreme polarization might prove useful in bringing together something approaching a majority of Americans who want radical change. Of Trump, you write, “The upshot of Trump discarding coded rhetoric about race is that our political discourse is at once both more vicious and more honest. Trump ripped the scabs off the wounds of American racism that the civil rights movement had worked to heal.” It does seem that we ought to be better off seeing clearly the racism in America rather than pretending—as so many people did when arguing that Obama’s election showed that we were post-racial—that it’s a thing of the past. But at this point, it definitely feels like the harm and ugliness of that shift has outweighed any spark it’s given to renew activism or generate lasting change. Am I being too pessimistic? I’m trying to avoid making more predictions. We see where that got me last time! But yes, if I had to guess, I do think you are being too pessimistic, but just barely. The forces of reaction and white backlash have grown bolder, and not just in the United States. Trump is certainly an emblem of such backlash, and also an engine of it. But I don’t think we’re in a 1930s moment, with fascism just around the corner. Rather, I think there is reason for slight optimism that such backlash will remain a minority politics and that the uptick of violence is the result of desperation. But we should remain vigilant. Another factor in Trump’s rise—and an indelible aspect of American life that activists on the left have to wrestle with, too—is the ever-growing public skepticism about authority. Many people have argued that that, too, is a product of the 1960s activism that fueled the culture wars: one of the central tenets of the social movements of that period was to not blindly trust or obey authority, and there’s little question that such skepticism is important. But if you’re a believer in the importance of government, if you’re an activist who wants to push for more engagement from citizens in making government better, how do you fight past that? What does the stance of the next generation toward government end up looking like? This speaks to the larger problem that I grapple with in the conclusion—a problem that we should all have to grapple: how do we have both multiculturalism and social democracy. The movements of the sixties rightfully fought against authority because authority kept so many people in positions of submission along racial, gender, and sexual lines. But in this just fight against such authority—against normative America—coupled with the neoliberal turn in our culture that normalizes the everyday war of all against all, it has become very difficult to come together in solidarity. But such solidarity will be necessary—as will government—if we are to overcome the existential threats on the horizon posed by runaway capitalism and global warming. I’m not suggesting we need to make peace with conservatives necessarily, but we on the broad left need to find a way to make peace with each other at the very least if we stand a chance of a decent future. I like to end with a really dumb question, so here goes. Several years back, someone on Reddit asked a question that is profoundly stupid, yet capable of generating intense argument: who would win a knife fight among all US presidents? So . . . who are you backing? FDR, wheelchair or not, was the toughest president in American history. My money would be on him.